Hawley is a village in the Hart district of northeastern Hampshire, England. The village is contiguous with the small town of Blackwater. 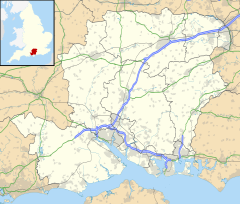 It is on the western edge of the Blackwater Valley conurbation, about 3 miles (5 km) north of central Farnborough, Hampshire, about 2 miles (3 km) west of Camberley, Surrey and about 33 miles (53 km) west-southwest of London. Hawley is also next to Cove, a large suburban village of Farnborough. The first written record of Hawley is from 1248, in the COMPOTUS DE CRUNDAL, spelt as Halely, Halle and Hallee and later in 1280 as Hallegh. And spelt as Hallie and Halley in the Documents relating to the Foundation of the Chapter of Winchester AD 1541–1547, published by the Hampshire Record Society in 1888 (Pages 69,72 and 87). The name is believed to be derived from Old or Medieval English Healhleah or Healhaleah meaning 'clearing or meadow of the nook(s)'; alternatively 'projecting corner of administrative unit' (Hawley is located close to county boundary with Surrey). Historical spellings also include Hawleye, Halle and Hallie. The tithings of Yateley and Hawley were listed as parcels of the Manor and Hundred of Crondall in 1567. The Parish of Hawley was created out of the Parish of Yateley in 1838. The Church of England parish church of Holy Trinity built in 1837 J.B. Clacy of Reading enlarged the church in 1857. Charles Buckeridge expanded it further in 1863, adding the chancel arch, chancel rib-vaulting and apse. The tower and spire were added in 1882. The building is in a Gothic Revival style of about AD 1300 and is listed Grade II (listing 26 June 1987). The parish's daughter church, All Saints', South Hawley is located in Chapel Lane at its junction with Fernhill Road. Hawley has a village hall, village green, equestrian centre, private leisure centre, a cricket ground and a playground area. Hawley has two schools. Hawley Primary School is a local authority school teaching boys and girls to Key Stages 1 and 2. Hawley Hurst School is an independent day school comprising a mixed nursery, prep and senior school. Some 2 miles (3 km) southwest of the village is Hawley Lake (via a forest walk about 20 minutes from Hawley Green), which is used by the British Army for basic sailing training and also has a private sailing club & watersports facility (Hawley Lake Sail Training Centre). The lake is used for dinghy sailing, kayaking, windsurfing and wakeboarding/water-skiing. There is also a beach on its southern shore which is used by local residents. Each Guy Fawkes Night the Army organises a firework display on the lake's islets, attracting thousands of visitors from many miles around. The steel structure of the cable car station in Johnny English Reborn. Hawley Lake and the surrounding woodland is often used as a feature film location, including part of the opening sequence of the 2002 film Die Another Day in which James Bond is in North Korea. It also used for the obstacle course and lake scenes in Spies Like Us, starring Chevy Chase, the 2005 film Sahara and scenes from the second Johnny English film Johnny English Reborn, notably the cable car station. The BBC filmed episodes of It Ain't Half Hot Mum at the lake in the 1970s. In April 2014, the woodland to the east and south of the disused airstrip was used as a filming location for the 2015 superhero movie Avengers: Age of Ultron. Throughout early 2017, sets were built for Jurassic World, Fallen Kingdom in the woodland. Brodie, Antonia; Felstead, Alison; Franklin, Jonathan; Pinfield, Leslie; Oldfield, Jane, eds. (2001). Directory of British Architects 1834–1914, A–K. London & New York: Continuum. p. 375. ISBN 0-8264-5513-1. Pevsner, Nikolaus; Lloyd, David (1967). Hampshire and the Isle of Wight. The Buildings of England. Harmondsworth: Penguin Books. pp. 280–281. This page was last edited on 10 December 2018, at 16:22 (UTC).